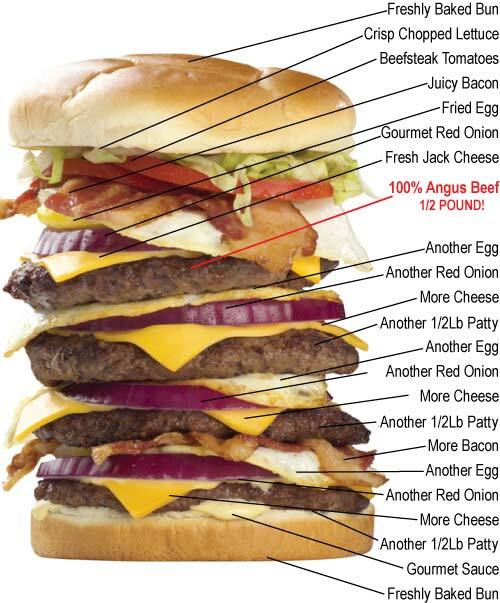 8,000-calorie burger has gone on sale in the US. 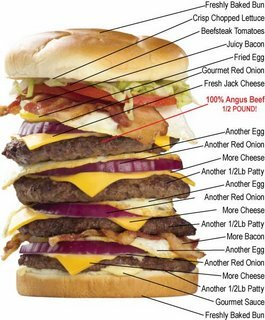 Quadruple Bypass Burger has four slabs of beef weighing 2lbs, three cheese layers, four bacon rashers, lettuce and tomato. Heart Attack Grill in Tempe, Arizona, has wheelchairs to carry customers out of the restaurant. Customers can also order the smaller Triple Bypass Burger and Flatliner fries cooked in pure lard. "You have to be a real man to dine here." You have to be a real man to dine here. My silly right-wing cousin is in Texas on business. I told her about this place. I'll bet a weeks pay she'll take her (R) friends there for dinner one night ! Whoa, an insanely enormous hamburger. I have never seen such a thing before on the internet. That's disgusting. Everyone of those people involved should be ashamed of themselves. It won't be funny when these people actually are in a hospital following their heart attacks. Is old on net. At least 3 weeks. if we can ridicule the hell out of smokers, why not fatasses? its just as unhealthy plus they look awful! No wonder americans are obese, naive and ignorants morons. ha ha ha, fatass jokes. oh wait, i had a hamburger with two pounds of beef the other day, and i'm 5'11" and 140 lbs. but i suppose most of you sitting at you computers haven't heard of exercise. less fat content then my gf good to go. The thing I like the most is the "Gourmet Sauce". Weird or what? damn, that looks so good. one man's meat is another man's poison. i certainly wouldn't consume such an atrocity of a burger(and i do happen to love them btw but that's just too big and disgusting for me). so basically..let them eat beef! whoever consumes it its their funeral and that's all folks! Calling a burger an atrocity and calling Americans morons is a bit heavy. Some folks are way too serious. I'm 5'8'', 165. I could eat about half of that. I ate a 2-lb cheeseburger with bacon (and mayo and etc.) at Meatcutter's Bar & Grill down by Eastern Market in Detroit. It was 2 1-lb. patties, though. 8000 calories! No wonder my wife had to lead me by the hand back to the car. When I ordered it, the waitress said to the other, "I can't remember the last time someone ordered the 2-pounder." Their menu also had a measley 1-pounder on it. The other waitress said, "Remember when that guy came in and ordered a 3-pounder for his friend? He ate the whole thing, too." Hmm, since when is eating a large burger an "R" (a term you've so cleverly coined. ha) thing to do? I'm a strict vegetarian since age 8, and am also a "silly right winger". Interesting that "L"'s consider themselves so open-minded and progressive but yet so quickly revert to blatant stereotypes and condescending speech. Where's the love bro? Although I'm sure you've already thought of that, since you're not an obese, naive, ignorants, moron. Right? *Please note you typed "obese, naive and ignorants morons". Ignorants? Too funny to be real. America is a fat shitland. All americans are fat, apart from chuck norris.